A look back over the junior grand finals from the NFNL’S under-18 to under-15 competitions. In Own Journey Travel Under 18 Girls, Montmorency took out the premiership with a 38-point grand final win over Diamond Creek at Crispe Park. The Pies went through the regular season undefeated and continued their march into the finals. Bianca Keogh from the received the best on ground after she played an exceptional four-quarters of football. In Under-17 Boys, Mill Park claimed a 37-point triumph over South Morang at Lalor Reserve. Mill Park just scraped into finals after finishing in fourth place, above Diamond Creek on percentage. The Stallions then went on to defeat Greensborough by seven goals in the first semi final, before they defeated Montmorency the week after by four goals in the preliminary final. The Stallions trailed at half time in the premiership decider, before controlling the second half by kicking eight majors to one. South Morang’s Blake Fitzgerald was awarded best on ground for his superb four-quarter performance. In Under-16 Blue, Diamond Creek led from start to finish in a 39-point win over Laurimar at Wallan Recreational Reserve. The Creekers started the game off strongly thanks to an early Ben Costa goal and took a 15-point advantage into quarter time. They didn’t look back from there. Ben Major was awarded the best on ground medal after winning plenty of the footy and capping his performance with a goal. In Under-16 Red, Montmorency took out the flag with a 10.8 (68) to 3.7 (25) win over Mernda at J.E Moore Park. The Magpies came from fourth spot to make the grand final after defeating Kilmore and Yarrambat leading up to the grand final. Montmorency came out firing in the premiership decider and booted four goals in the first term to lead by 27 points at the first change. They held sway over the next three quarters to claim the flag. Nikolas Cox and Max Hughes were outstanding in the victory, with Hughes finishing with a game-high four goals. In Under-16 Girls Blue, West Preston-Lakeside won its first girls premiership with a seven-goal win over Montmorency at Crispe Park. After finishing runner-up multiple times in recent years, the Roosters produced the goods to take out the 2018 flag – courtesy of a five-goal to one second half. Ashleigh Snow was best afield, while Jaydah Hope, Tallia Pulcino and Luisa More led the goal scorers with two majors each. 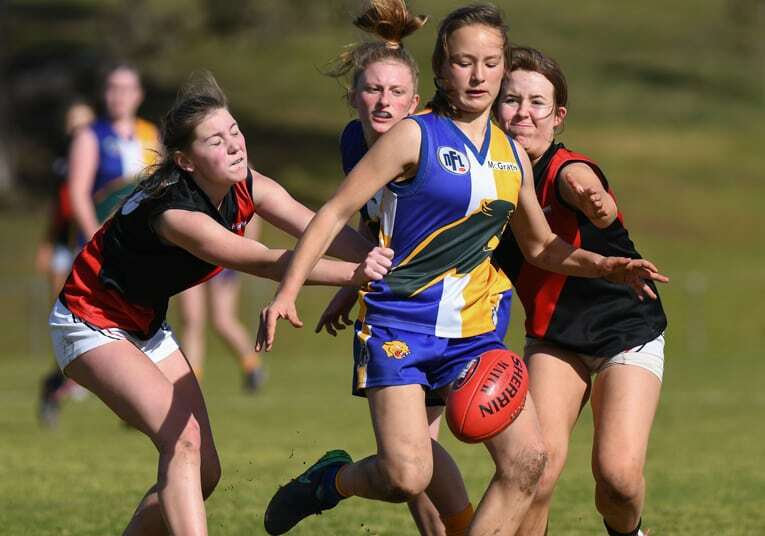 In Under-16 Girls Red, Northcote took a 20-point win over Eltham at C.T Barling Reserve. The game was closely contested for the first half, with scores tied at the main break. However, Northcote then broke away in the second half kicking three unanswered goals. Chloe Williams was named best afield for her two-goal performance, while Louisa Harper also booted two majors. In Under-15 Blue, Laurimar took out a four-point win over South Morang at Coventry Oval. The Power trailed for the majority of the game but never showed signs of giving up – booting a goal in the dying minutes to hit the lead and then held on for a thrilling win. Kaiden Arthur was best afield in the come-from-behind triumph, while Andre Ialongo was the Power’s leading goal scorer with two majors. In Under-15 Red, Research came out victorious over Diamond Creek at Lalor Reserve. The teams were locked in a two-way battle for top spot all year – with the Creekers just edging out the Searchers for first place. However, Research was able to get the upper hand in the finals – winning both the second semi final and grand final. The premiership decider was a close affair, with the Searchers getting on top late to prevail by 15 points. Patrick Dozzi and Harvey Littlefield played great games for the victors.